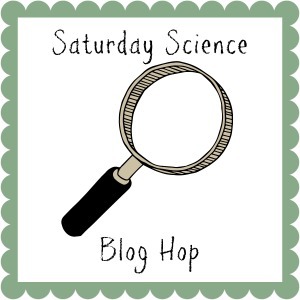 Welcome back for another Saturday Science! Christmas and Winter are here. Its in the stores, on tv, and all over Facebook and Pinterest. We have been having a lot of fun around here with more and more explorations. 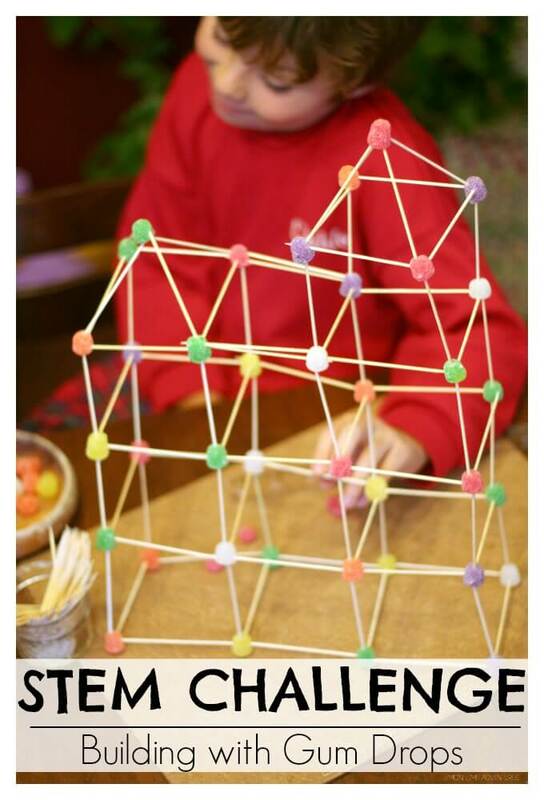 If you recall our outdoor tinkerlab and our marble run, you know just how much we love STEM activities around here. 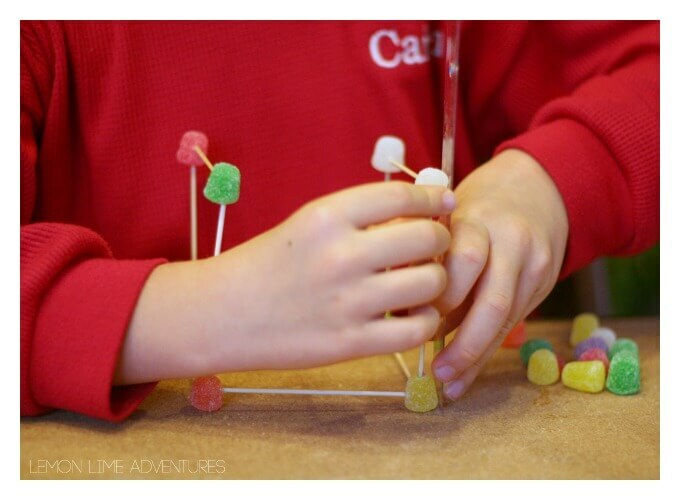 After our fall building challenge, the boys were determined to try another activity for creating and engineering, and building structures of their own unique designs using candy gumdrops. Have you ever seen the Marshmallow challenge? It’s one of my favorite STEM challenges around. In fact we even tried the marshmallow challenge with candy pumpkins in the fall. That’s why I thought it would be really fun to take that challenge and make it seasonal again. Setup is super simple. Last time we did this I just put out a small bowl of gum drops and a jar of toothpicks and let my kids go to town. This time I put a little more constraints on the challenge to make it a little more challenging. For this experiment, we tried 2 different challenges. 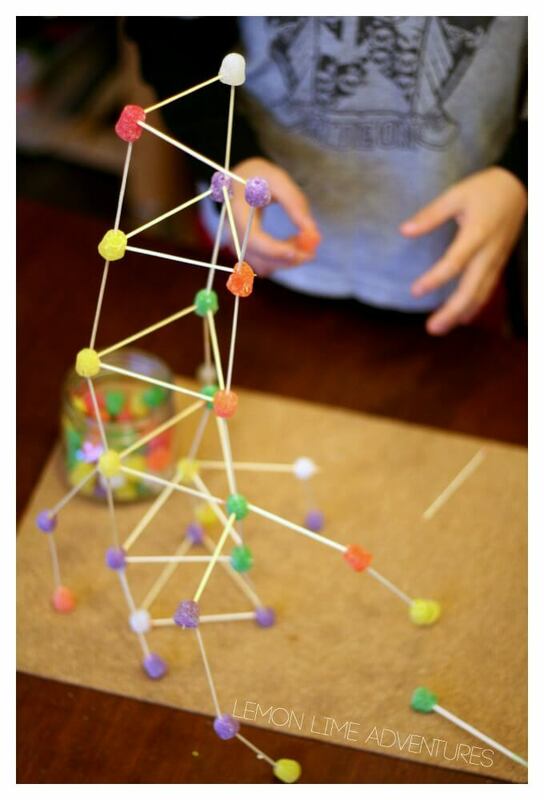 Option 1: build the tallest tower you can with a set number of toothpicks and candy gumdrops. 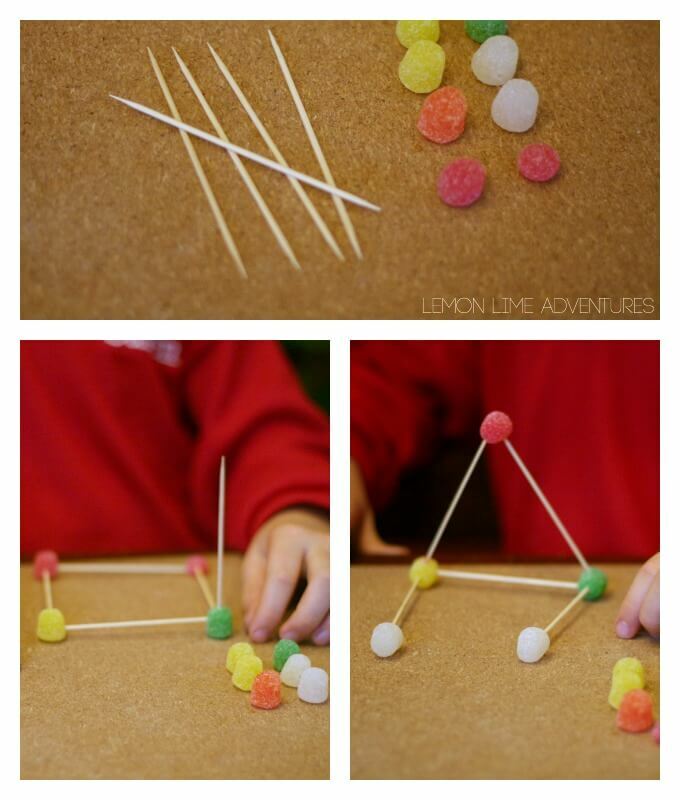 Option 2: build structures with candy gumdrops and toothpicks. We started with Option 1. 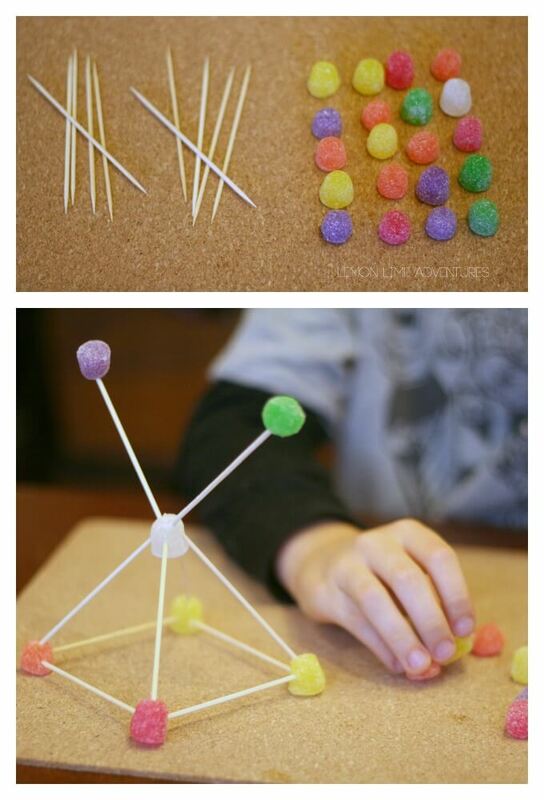 I gave each boy 5 toothpicks and 10 gumdrops and challenged them to build a tower. It didn’t take long to realize that there was not a whole lot they could do with this number of toothpicks and gumdrops. What I loved was how they continued to try new designs to get the highest reach. 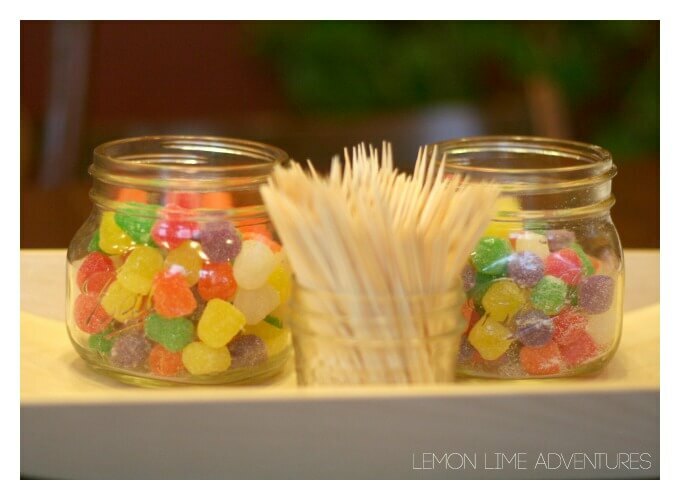 Next, it was time to try 10 toothpicks and 20 gum drops. This was a little more fun, but still challenging. This gave them a little more room to engineer a variety of structures. I just loved this first design that Legoman (age 9) made, but he was unhappy with the height, so he went back to the drawing board. There. Now, he was starting to get some height to his structure. With each new design, he would measure and problem solve how to go higher. However, the boys noticed that every time they had gumdrops left over. So they asked if they could have equal parts, gum drops and toothpicks. Now, we were getting somewhere. 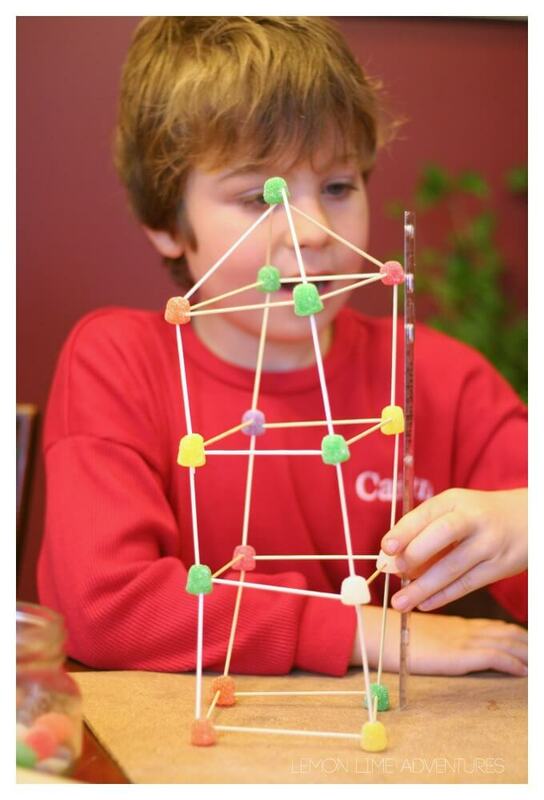 The best part of this activity is how it allows children to think and problem solve to come up with a variety of solutions for the “best” structure. Whether you let them have a set number or let them free build it can be extremely beneficial for building their thinking skills. When we built with candy pumpkins, Bones was determined to build his dad’s apartment. He lacked the skills and the ability to be flexible in his thinking last time. However, just one month later, when we tried this activity again, he was able to build exactly what he wanted. In fact his structure was so sturdy, it is still on display in our living room for everyone to see. As always, Legoman’s designs pretty much amaze me. While this design did not stand for as long as he wanted, it was pretty spectacular. Unfortunately I wasn’t able to get the final picture (although, we do have it on display too) because it kept leaning and I was trying to help keep it up to avoid any sort of meltdowns. What do you see when you look at his structure? He saw a rocket. You know what, once I looked at it again. I see exactly what he is talking about! 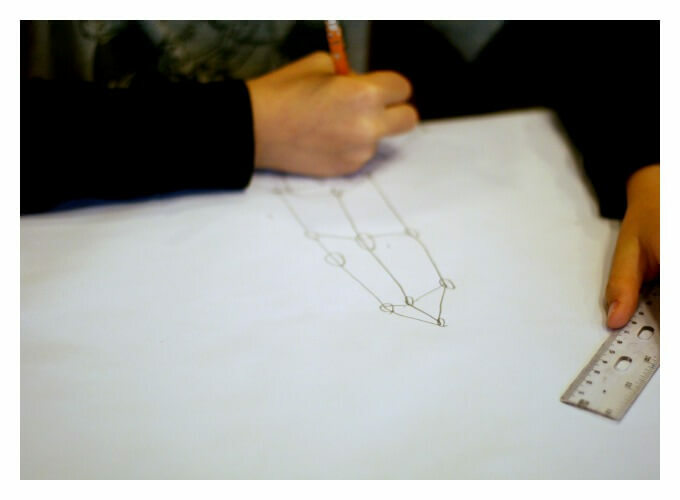 What do you think your children would build? 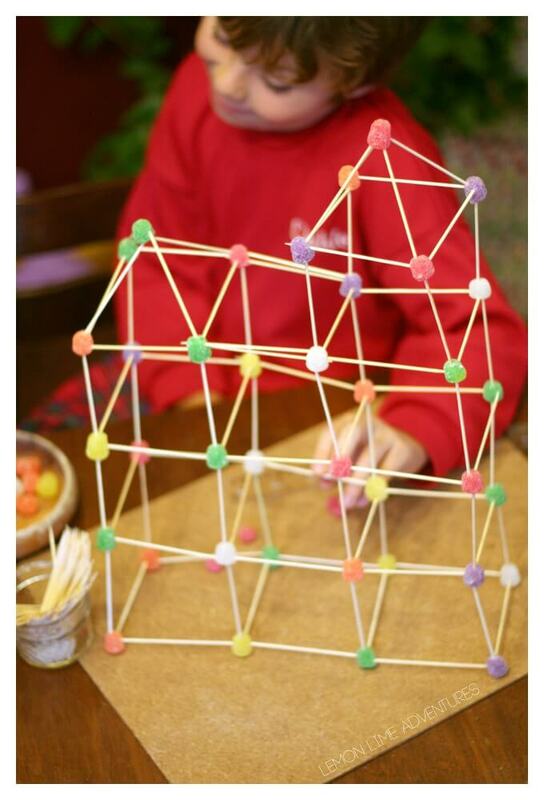 How tall do you think you could get a structure with gumdrops and toothpicks? I would love to see pictures! Do you have a favorite STEM Science Experiment? I would love to know! Connect with me on Facebook, Twitter, Google+, Pinterest, Instagram or subscribe by email. I can’t wait to hear your ideas. This week we have a special surprise! While planning for this week and putting links into our shared document, all of the hosts of this hope realized we had similar posts. 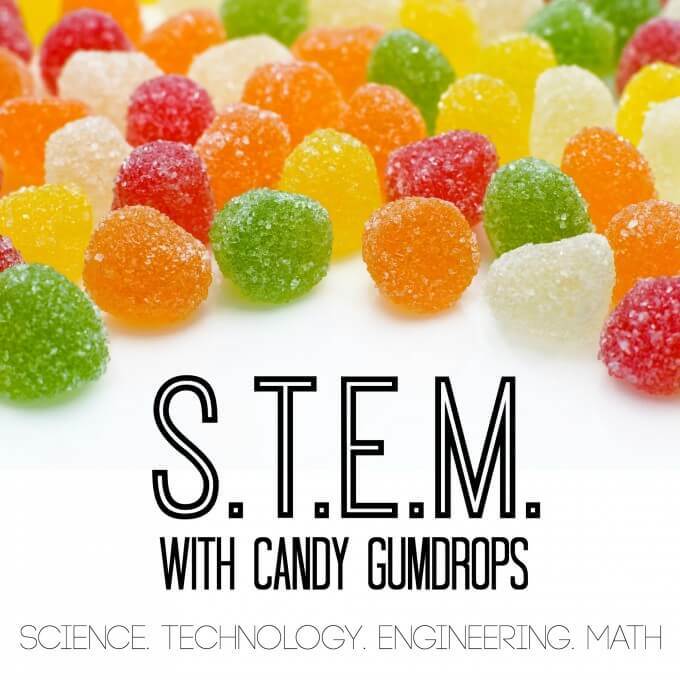 So we decided to turn today into STEM Gumdrop Series! 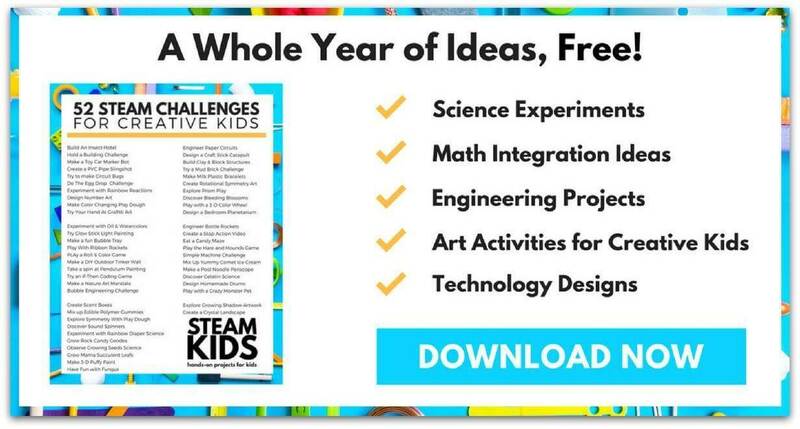 I am so excited about all of the fun experiments and activities we have done with one material and I think it will be a great resource for you! Would you believe that when we went to look for a feature from last week, there was a gumdrop experiment? How cool, is that? 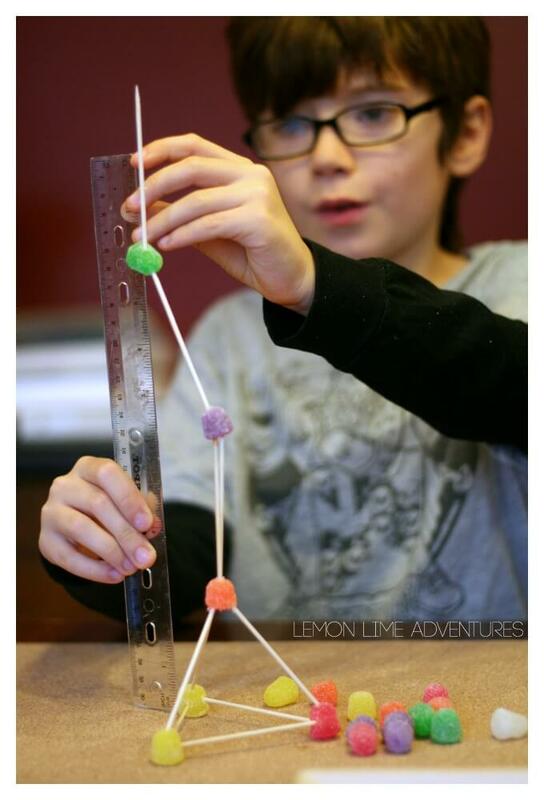 VISIT THESE GREAT BLOGGERS FOR MORE FUN STEM GUMDROP FUN! It looks like your son had as much fun as my daughter building with the gumdrops! Thanks so much for including ours too. Off to check out the other projects, pin and play.